ENC-300-DVI - H.264 (MPEG-4) HD/SD Encoder with DVI and HDMI input | AdvancedDigital Inc.
Realtime H.264 HD/SD Encoder-Blade with DVI and HDMI input (embedded Audio supported) for encoding/transmitting ISO-compliant H.264 HD/SD transport streams. Compatible to PC XPlayer, IPTV set top boxes and the iCue Live and VOD Streaming Server. The ENC-300 encoder is designed for IPTV and live streaming. It is ideal where single computer based DVI signals or HDMI signals are distributed or published on a network or the internet. 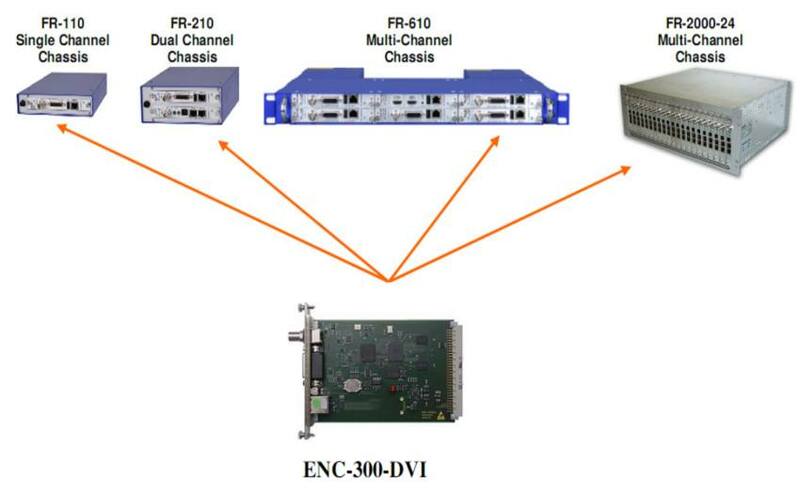 The ENC-300-DVI mainly targets medical, military, control room and training applications where high resolution DVI/HDMI signals from medical instruments and cameras, radar devices, digital signage player, or any kind of PC desktop views – need to be shared, published and distributed and recorded. ENC-300-DVI encoders incorporate low latency signal compression, creating full resolution video streams in HD/SD and DVI resolution. To access the intuitive graphical user interface use your standard web browser from any PC on the network, no special or additional tools are required. Remote network configuration is also supported over SNMP, by Telnet and by control over the local COM port. Multiple ENC-300 blades are operated inside the FR frame series. The encoder is also available as the compact PORTABLE device. High-density requirements are solved by operating the ENC blades in the FR-2000-24 (4 RU rack mount) or FR-610 (1 RU rack mount) multi-channel racks. Different types of DEC decoder blades, ENC encoder blades and DVB/IP videogateways can be “mixed and matched” inside the FR-frame series. FR-610 – 1 RU rack mount chassis (max. 6 blades) with single power supply. FR-610-DPS – 1 RU rack mount chassis (max. 6 blades) with redundant power supply. FR-2000-24 – Redundant high density 19“ 4RU rack mount chassis (max. 21 blades).